We are making butter today. And by “we,” I mean you and me together. I am inviting you to make butter with me. Why would we make butter? Because we can, because butter is lovely, because it is magically easy to make yourself. Are those enough reasons for you? Okay then, let’s do it. Pour the cream into the jar, until it is about half full. Tightly screw the lid onto the jar. Shake the jar continuously for about 3-5 minutes. The cream will begin to feel heavier, and you will see little clumps of butter start to form. Continue shaking until most of the cream has turned into a large clump. There will be some leftover liquid in the jar, which is buttermilk. Open the jar, and strain the liquid from the butter into strainer set over a bowl (the buttermilk can be saved, and used to make some tasty buttermilk pancakes!). Butter will spoil faster if there is leftover buttermilk on it, so drain off as much as you can. Rinse the butter with ice-cold water, and drain completely. 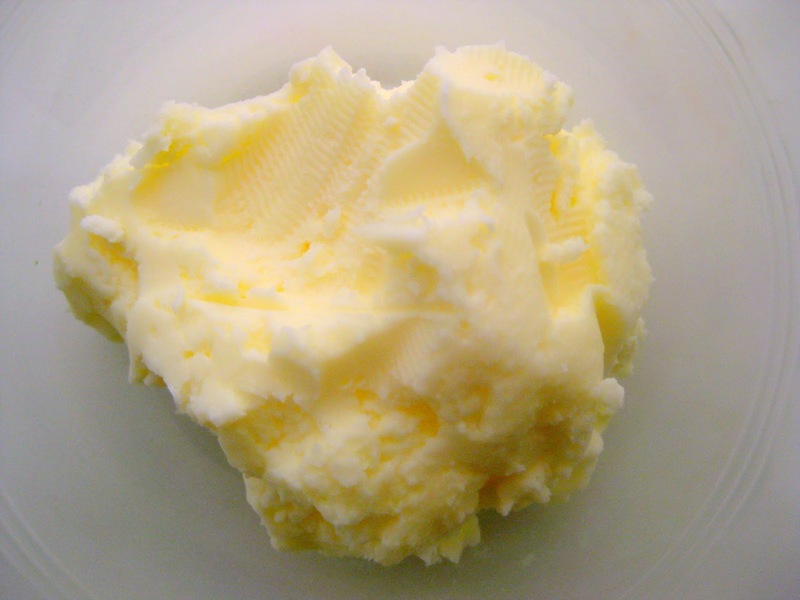 Store butter in an airtight container for about one week. You can also add salt, honey, or fresh herbs to your homemade butter, for some delectable butter spread!